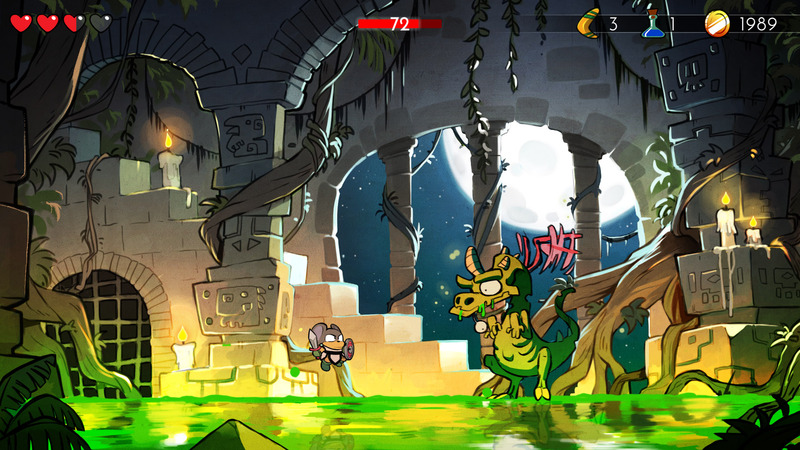 The Dragons Trap is a 2D adventure game. The kids would call this style of game MetroidVania; by this I mean you unlock new abilities through the animal transformations which then enable you to progress to new areas previously restricted in the games large map. As Hu-Man (yes seriously) you begin the game playing through the final segment of the previous game in the series (Wonder Boy in Monster Land). Only this time the section is much more simplified. Hu- Man is fully powered up and the big boss is significantly easier. Once you have dispatched the beast instead of getting the happy ending Hu-Man has been waiting for he becomes cursed and turns into Lizard man. So Hu-Mans happy ending is now in a different castle. The goal of the game is simple, lift the curse and return to your human form by traversing Monster World and wiping out the population of dragons. Each time you slay a dragon boss you transform into another animal creature such as Mouse – Man, Piranha – Man and Lion – Man. Each of these animal transformations provides you with a unique ability to help you progress to new areas of Monster World. Mouse – Man can climb around walls, Piranha – Man can swim and Lion – Man has a larger sword swing and he’s a Lion which is just grand. Your weapon for most animal forms is the sword and shield you can visit the shop with the infamous smoking pig character who will probably mock you but also sell you armour, swords and shields which can be exchanged for gold. Gold is farmed from slaying several colourful and often cute looking monsters. The price of these items is quite steep so you may find you need to revisit areas and literally farm for gold. As well as gold, monsters will drop occasional health hearts and magic and support items. These include fire balls, lightening, mini tornadoes, boomerangs and an arrow which shoots straight up which is particularly useful against a cool looking cloud monster. These items can be switched and used at the tap of a button. A welcome improvement from the original Master System game where you had to pause to change items. While death is quite inevitable in The Dragons Trap its not the end of the world. All the money you saved carries over and a little roulette spins on the game over screen giving you a chance to obtain a free potion on your next attempt. You are stripped of any magic or support items you might have collected. The Dragons Trap is a very true to form remaster of the original Master System title so much so you can actually use old password saves from your Master System game with the remake. The game is so faithful in fact a lot of the criticisms of the game have been left in. For example, projectile weapons from enemies do an absurd amount of damage even with upgraded equipment while touching an enemy inflicts very little. The developers have made some changes to the game for example, the game offers multiple difficulty settings easy, medium and hard. The game now allows you to switch magic items as well as use them with the touch of a button. A lot as changed since the Master System controller which was literally a D-pad and two buttons. Hell, the pause button was on the damn console for some reason. The developers have also put in the option to play as Wonder Girl which is a great idea. Even though the vast majority of the game you are playing as the animal characters. You only see the boy/girl sprite at the beginning, or end or when you die. Finally, the game has added some hidden areas which basically act as challenge rooms, they’re tough areas but not compulsory to complete the main quest. Difficulty-wise you can expect things to get quite challenging later in the game. You really need to collect money and upgrade your gear as often as you can to avoid having a really rough time later in the game. Even then it’s not an easy ride but it does fill you with that great satisfaction once you finally conquer the final castle and boss. If your a newbie to the series completely the game will probably take you no more than six to eight hours to finish. This time will significantly drop with multiple playthroughs or if you have experience with this sort of game. It is quite short but the game doesn’t feel like it outstays its welcome. With so many games available that clock in way over twenty hours these days having these short sweet experiences feels very satisfying. Unlike longer games I feel much more compelled to complete this game multiple times. 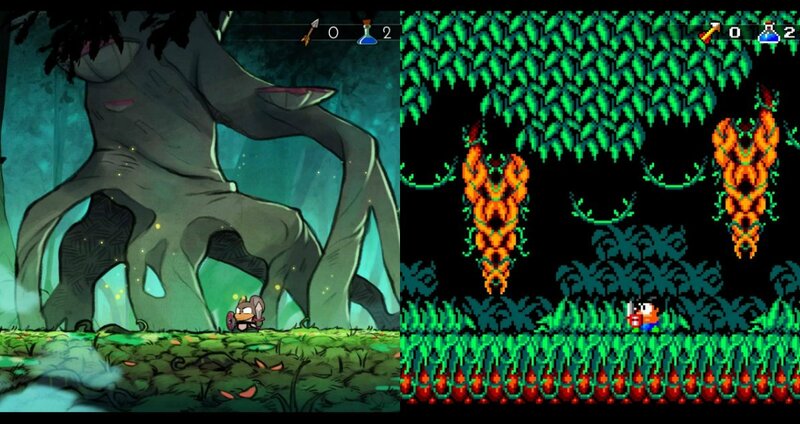 So in the end, Wonder Boy The Dragons Trap is a beautiful remaster of one of the best Master System games. I felt very conflicted summarizing this game as its hard to ignore that this is just an older retro game with a lovely coat of paint and an amazing soundtrack added. However, I don’t feel Lizardcube were aiming to remake the wheel here. After watching the making of videos which are unlocked as you progress through the game, it’s clear to me this was a letter of love to a beloved retro game. 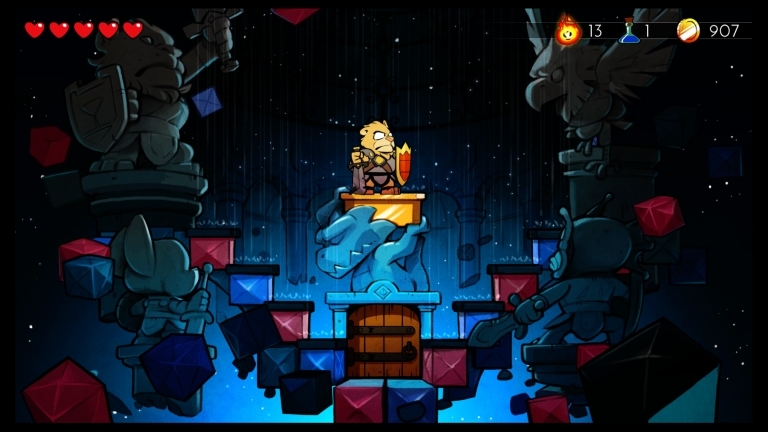 As someone waiting so long for more Wonder Boy I could not be happier with it. If you loved the previous game you probably have already brought this but if you new and “Wonder”ing whether to take the plunge on the Wonder Boy series this is a great place to showcase one of the most treasured highlights of the series. No review code was provided by the publisher, it was published by the reviewer and played on the Xbox One console. Wonder Boy: The Dragon’s Trap is currently available on Playstation 4, Xbox One, and Nintendo’s Switch console. The slightly delayed PC port will be released on Steam tomorrow, June 8th. All versions currently have an initial price of $19.99 and a tangible version will be released sometime this summer by Limited Run Games.